Diva, I need your help. 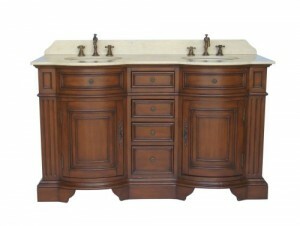 I’m trying to find an antique style vanity for two of my bathrooms. The problem I’ve had so far is finding vanity styles that honestly feel antique, without actually spending money on something that is that old. The first bathroom needs a vanity for double sinks, the second requires a bathroom vanity for a single sink. Also, I’d prefer that they not match exactly, as this takes away from the antique feel of the bathroom. So close, but not matching would be ideal. Can you think of any examples I might consider? I’ve had little luck on my own. 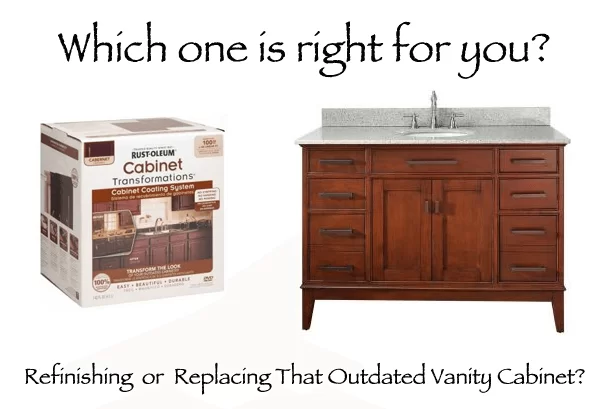 Well Angie, I actually have two different antique vanities that come to mind. Each one will fit the needs of your bathroom quite nicely, based on what you’ve described to me in your email. The first one is going to be for your bathroom requiring the double sinks, with the last one being a nice a fit in your single sink bathroom. Don’t let the price of this double sink vanity fool you. The 72″ Kleinburg double Sink Bathroom Vanity is worth every penny for the look you’re aiming for. The best part is that it presents itself in a very tasteful cream marble counter top, while being supported by a very warm looking vanity structure. And the under mounted bisque porcelain basin brings the entire piece together very nicely. Now the faucets are sold separately, so you may want to shop around a bit for the best match. This said, anything themed for the classic look that comes in a darker tone will work very nicely. The provided storage offered by this vanity will meet the needs of just about anyone looking to fill up this kind of space with a double sink. The material this vanity is made of is of the highest quality, so it will not present any problems with lengthy exposure to humid conditions, such as being installed into a high traffic bathroom. Now this attractive little vanity is just perfect for your second bathroom. And as you can see from the image to the left, the 31″ Fiesta sink vanity Cabinet comes with a marble counter top, while offering up warm wood tones that vary ever so slightly from the tones found with your other bathroom vanity. This single sink vanity also offers you the option of the under mounted biscuit porcelain basin. It should also be noted that this smaller vanity offers greater degree of design whereas the one above, is not as “curvy” looking. Based on what you shared in your message to me, this is more of a feature than a problem. It will help to lend a distinctive flare to your smaller bathroom without looking out-of-place. Sometimes avoiding the “matchy-matchy” look to home decor can go a long ways. If after looking at both of these, you’re still not sold, I do have other options. You could always consider a Rustic Bathroom Vanity or another type of Wood Bathroom Vanity Design altogether. Either way, you do have some solid choices to browse through.